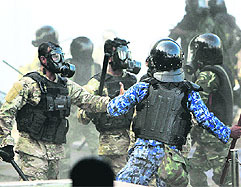 Mutiny by sections of the police and the army today forced Maldivian President Mohamed Nasheed to step down and hand over power to the Vice-President, Mohamed Waheed Hassan. 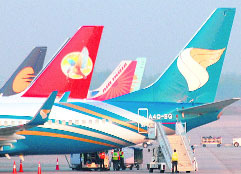 An empowered Group of Ministers (GoM) today fulfilled a long-pending demand of private airlines by giving the go-ahead for the direct import of jet fuel - a move that will now help cash-strapped carriers save on high sales tax charged by some states and significantly lower staggering financial losses. The Union Budget delayed because of elections in five states will now be presented on March 16, four days after Parliament will begin its budget session. The budget session, which normally commences in the third week of February, will start on March 12 with President Pratibha Patil addressing the joint sitting of members of both the Houses of Parliament. The much-awaited elections to the Delhi Sikh Gurdwara Management Committee have been stayed. 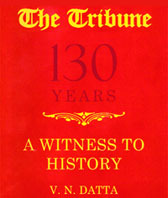 The elections to the cash-rich and politically influential body of Sikhs were slated for March 11. Two ministers of the BJP government in Karnataka were caught watching a �pornographic clip� when proceedings were on in the Assembly. The ISRO row showed no signs of abating as former ISRO chief G Madhavan Nair today hit back at his successor K Radhakrishnan dubbing as "another lie" the latter's claim that an inquiry was conducted into charges and lapses relating to the Antrix-Devas deal. He could have been like any other 'raagi' after his retirement in 1998 from the Golden Temple, where he worked for 30 years. 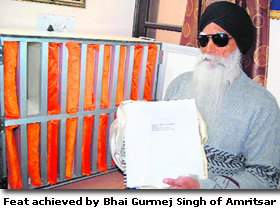 But Bhai Gurmej Singh had a wish: Being blind, he wanted many like him to read the holy Gurbani.